Ginseng is an adaptogenic herb traditionally used in many cultures as a rejuvenating tonic. Power Ginseng GX2500+ contains a concentrated 30% ginsenoside rich extract from Panax CA Meyer 4-6 year old korean ginseng roots. Up to 8 times stronger than other ginsengs. The choice of root is very important. We only use 4 to 6 year old Panax **C.A. Meyer Korean Ginseng Roots in the manufacture of our Super Potent *Ginsenoside Rich Capsules. 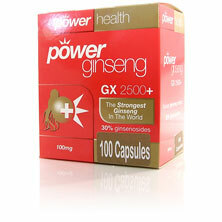 POWER GINSENG GX2500+ contains both groups of Ginsenosides, Rg1 and Rb1 which give Ginseng its adaptogenic properties. ** Regarded as the Best Ginseng in the World. 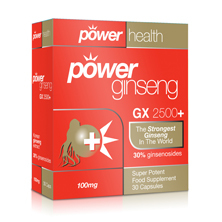 Take POWER GINSENG GX2500+ as part of your daily regime. Dose:Adults and children over 5 years old - One capsule per day with meals as a food supplement. Best Before End See Base. Free from artificial colours and preservatives, yeast, gluten, starch and lactose.